If you want something different from your favourite but usual dosa-chutney combo, drop by Pumpkin Tales for brekkie options across cuisines. What did we like here? Read on to know! Tucked away in one of the quieter neighbourhoods of Alwarpet, Pumpkin Tales is a two-floored café with a bakery on the ground floor. You can take home some fresh baked goods from here but if you want a full-blown meal head on upstairs. We love the yellow-orange colour scheme of the well-lit space (so “pumpkiny”). The staff is courteous and we were given a host of delicacies by the end of which we were stuffed to the brim. But we ain’t complaining, ya’ll! We started off with coffee; do try the SEA Cold Coffee, a large double shot with condensed milk, a great pick-me-up to start the day with. The Marigold Green Tea with lemon grass is refreshing if you’re a tea-drinker. 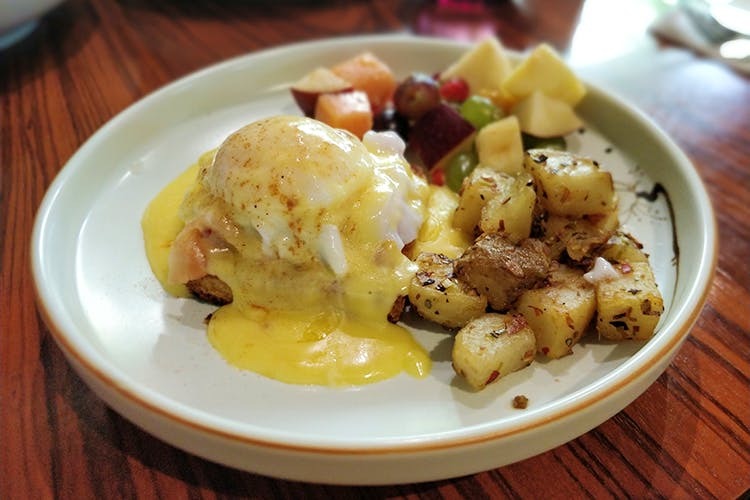 Our other recommendation would be any of their Eggs Benedict dishes; we had the one with smoked salmon which cut the creaminess of in-house hollandaise sauce and runny eggs perfectly. A surprising favourite ended up being the Congee. A soul-warming bowl of this rice porridge brims with flavour from the kick of spice from the red chillies, the sweet fried shallots, and crunchy peanuts. A must-have. Vegetarians could try the mushroom and avocado toast for its earthy flavour. We weren’t too impressed with the Breakfast Hash (that also has vegan options), with tons of soft potato, and additions like cheese, chicken, herbs and topped with a fried egg. The potato overpowered the dish and felt too filling. The portion sizes here are pretty big so most dishes can be shared between two gluttons (tested by us). We finished our meal with the French Toast which wasn’t anything out of the ordinary. We never thought we’d say this but we’d definitely be coming back for that porridge. Night owls, do note breakfast is available only until 11.30am so try not to come in late, yeah?